A lot of people prefer eco-friendly pest control methods. But some think that these techniques are not very effective, and so they continue using traditional pesticides. Well, it’s really a matter of preference, and each person can choose the path that he wants to take. As they say, “to each his own.” But just to spread the word about commonly used pesticides, here are some examples. This also includes information about possible detrimental health effects. Hydramethylnon is an insecticide that is often used in cockroach and ant baits. It is an odorless crystalline compound that appears yellow to orange. This is a typical choice for baits because of its delayed-action characteristic. Hydramethylnon is a metabolic inhibitor. This means that the substance attacks an insect’s metabolic system. The effects on the metabolic system include – lack of energy and overall inability to perform every day functions, like foraging and feeding. An ant that’s been contaminated with the pesticide won’t immediately show the chemical’s detrimental effects. These often become evident after 24 to 72 hours, which means that the infected insect will still be able to bring and spread the substance to other ants in the colony. According to the EPA, hydramethylnon shows low acute toxicity in lab tests using animals. However, it causes eye and skin irritation, and it is harmful if swallowed or if absorbed into the skin. Hydramethylnon is also a Group C carcinogen, which means that there is evidence that indicates that the substance has carcinogenic potential. Avermectin is an insecticide and a miticide (a substance that kills mites). 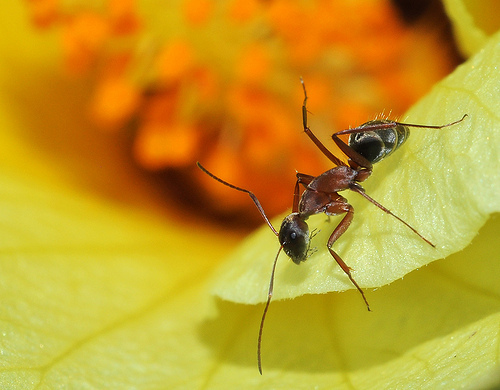 It is an odorless, yellow to white crystalline powder that’s often used to treat lawns, turfs, greenhouses, and other areas that are infested with ants, especially imported species, such as fire ants. The treated area must not be used to grow crops. It’s a versatile pesticide that can be applied in the ground or in the air as foliar spray. This substance has acute toxicity to mammals, including humans. Avermectin does not typically cause skin irritation, and most adverse effects are transient or temporary. In rare cases wherein overdose or widespread exposure occurs, avermectin can cause respiratory distress, coma, and even death. Treatment is focused on managing symptoms. Fenoxycarb, which appears colorless or white, is a substance that affects the growth of insects. The chemical prevents pests from reaching maturity because it contains an element that imitates the juvenile hormone which hampers insects’ proper growth and development. This is why it’s also known as a juvenile hormone analogue or JHA. It is often used in ant baits, and it’s a popular chemical for controlling fire ant populations. One good thing about fenoxycarb is that it has been developed in a certain way so that it will only have slight effects on non-target organisms. Fenoxycarb is an eye irritant. When regularly exposed to a high dosage of the chemical, liver injury can occur. In addition to this, fenoxycarb is a recognized carcinogen, as well as a blood, endocrine, and gastrointestinal toxicant. The article is by Claire Pritchard. She often writes about Admiral Pest Control in Costa Mesa and hopes to spread tips and how-tos about pest management to homeowners.